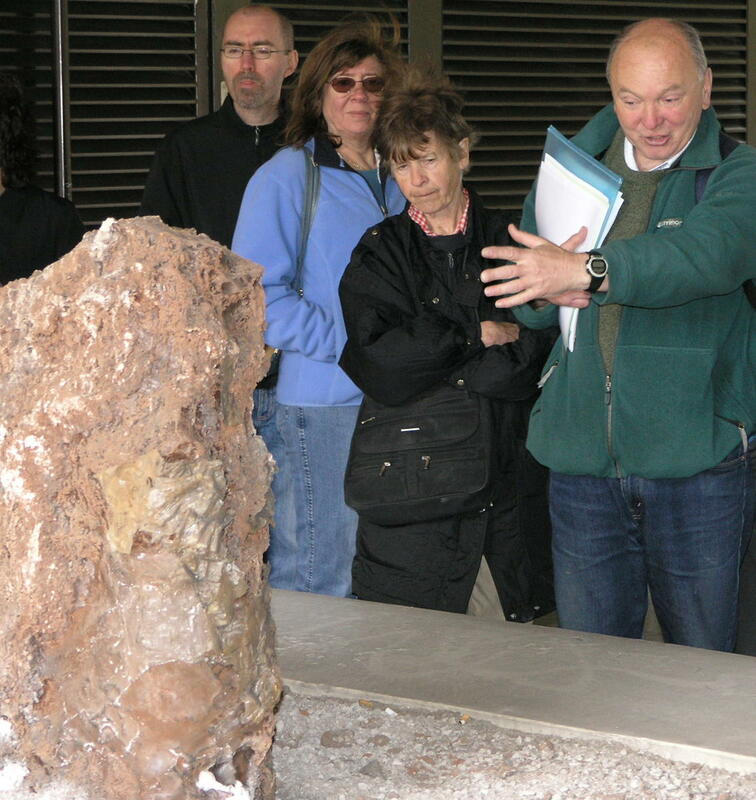 On Saturday May 14th 2005, about twenty five members of the Hampstead Scientific Society and the Amateur Geological Society took part in a joint excursion to visit sites of scientific interest within the City. The walk was organised by Mike Howgate, Chairman of the A.G.S. Members met at the Museum of London, situated in the Barbican complex, where they examined the Roman water lifting machine, possibly one of the first examples of machinery to be built in this country. 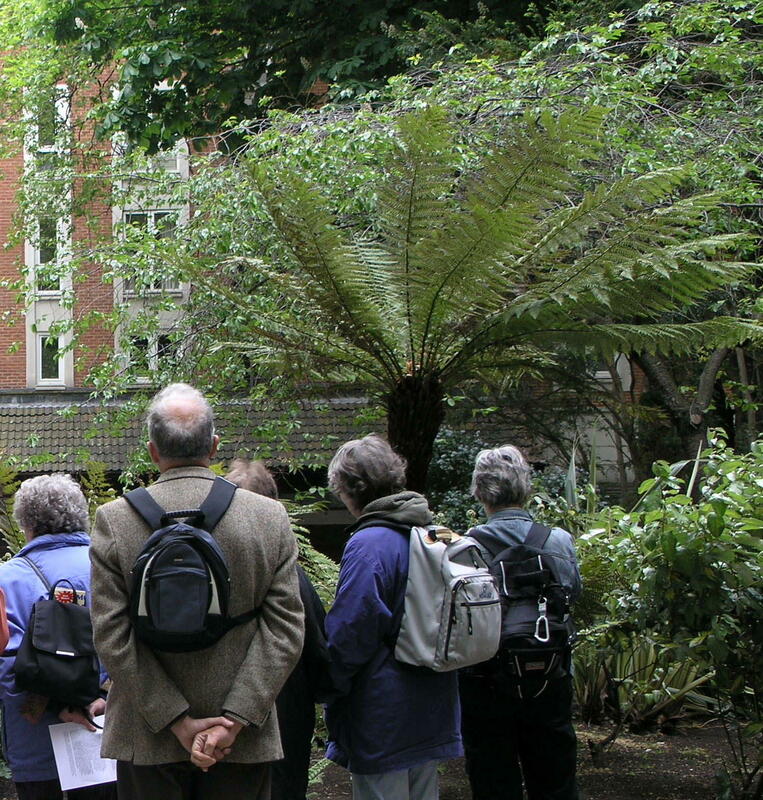 We then moved on to Postman�s Park to look at some tree ferns which are classic �living fossils�. The party then moved on to 81 Newgate Street, the site of Marconi�s first public radio transmission in 1896. In a passage off Newgate Street, the Merrill Lynch building features benches made from Portland stone filled with fossil gastropods and bi-valves- the well known �Portland screws� and �osses �eds.� dubbed by the quarry men. It was then on to St.Pauls Cathedral to examine the main entrance steps featuring sections through 450 million year old fossil nautiloids, and the bollards constructed from Shap granite, one of them featuring a fine example of a Xenolith. In the Churchyard there is a fine example of a yet another living fossil, a Ginko Biloba tree,. It was then on to Aldermanbury where the Museum of the Worshipful company of Clockmakers is situated which houses one of John Harrison�s chronometers. The frontage of the Post Office in Fore Street, is faced with slabs of stone that was once volcanic ash, laid down some 450 million years ago and which shows evidence of earthquake activity at that time. Also in Fore Street, the Salter�s Company displays a huge lump of rock salt close to a fine section of the old Roman/medieval London Wall. Both the H.S.S. And the A.G.S. Wish to thank Mike Howgate for arranging such an interesting walk around the City.